Beer filtration kits - what are the best ones to use? The thing about beer is it's not just about how it tastes. It's also about how it looks. A good looking beer says to the mind, this beer is clean and crisp and ready to drink. A cloudy beer can suggest dirt and sediment and the lizard brain just doesn't want to drink it. So many a brewer will do a variety of tricks to make their beer clear. Cold crashing, using gelatin, refrigeration and the like are pretty hand methods but a beer filtration kit can work absolute wonders to clear beer. So other than the goal of clear beer, why would you filtrate? Filtering will take out the yeast, any tannins and some large proteins from your beer that can contribute to off flavors and haze. And while it is true that such solids do precipitate out of the beer through lagering and the ageing process, filtering greatly accelerates the process of clearing by physically removing them in minutes. Which means you don't need to sit around for weeks or even months for your beer to become ready. This is not to say that if you use a beer filtration kit your beer bottles will not have any sediment (how we wish that could be) AND in fact, using a filter is not for bottle brewers. This is because the filtration process removes the active yeast from the beer. So if you were to bottle your filtrated beer and add sugar for the customary secondary round of fermentation - fermentation will not occur as the yeast will no longer be present in the beer to eat the sugar. So what to do then? 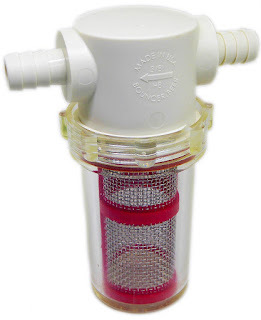 Filtration is for DIY home brewers who use a kegging system. The popular method is to filter your beer directly into a keg using CO2. You can then bottle it from the keg using a counter-pressure bottle filler or a beer gun. The true beauty of a using a bottle filler attached to the keg is that it prevents the loss of any carbonation. Home Brew Stuff can of course only say good things about their kit. They boast that the "filtering process can eliminate weeks of secondary aging, giving you better tasting beer much quicker than before. During secondary aging the primary effect is that more yeast settles out of suspension, carrying with it, proteins, polyphenols, and other flavor compounds that contribute to the "green" flavor of un-aged beers. Filtering will eliminate most of this yeast and those flavor compounds in a matter of minutes instead of weeks. " A standard 5 micron filter included is suitable for most applications and it will filter up to 10 gallons of beer when used on two consecutive kegs. Note that the filters should not be reused. 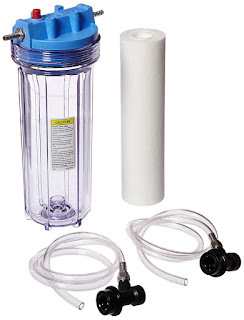 The kit also comes with liquid ball lock fittings on both sides, (2) 30" lengths of tubing, 10" clear filter housing, and one 5 micron filter cartridge. "The quick connects are great, they make purging the o2 out of the line quick and easy. A must for any home brewer who wants to elevate the quality of the beer." "We ordered two of these kits and interconnected them together with great results. The nice thing about these filters is that they are easily accessible and cheap when compared to the plate filters we use to utilize for our plate filtering system." "Easy to use, no leaks like the plate filters, cleans up easily. 5 gallons took only a half hour. The valve operates as expected. I recommend going down to a half micron to really polish your beer. " With reviews like that, you might want to check out the price on Amazon. The Midwest filter system has been reconfigured to make filtration easier and less expensive. In order to filter beer or wine you will need to have a Cornelius keg system with a minimum of 2 kegs. Un-carbonated product from one tank is pushed with CO2 through the filter into the sanitized empty tank. In order to polish your beer and remove yeast you will need to do this in a two stage process, which means with 2 kegs you will have to clean and sanitize the originating keg before sending the beer back through the fine filter. The first filter you will use is a 5 micron sized filter to remove large particulate (hops and proteins) that if left for the fine filters would clog them before you finish. Once your beer passes through the 5 micron filter then it is up to you how fine you want your product filtered. The fine filters consist of a 1.0 micron and a 0.65 micron filter. The 1.0 micron filter should filter out 80-90% of the yeast in solution while the 0.65 - 0.5 sterile filter will filter out 100% of the yeast. 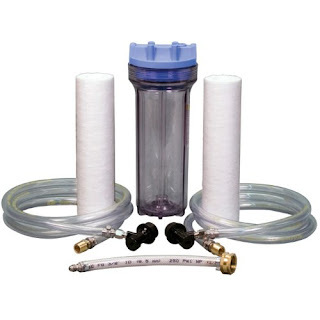 "This filtration kit has taken my beers to the next level of quality. I can produce competition level, crystal clear beers now. 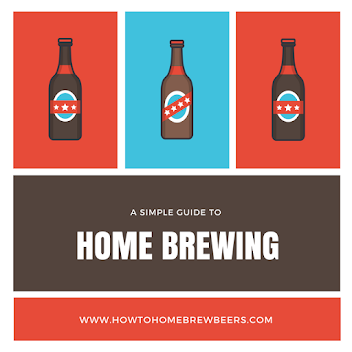 I would highly recommend this for any home brewer looking to take their brew to the next level." "Solid, heavy duty filter housing a beer lines make this a great product! Cleaning attachment makes cleaning the system simple and efficient. Takes maybe a hour and a half to clean and sanitize kegs and complete the filtering process but the beer is clear and crisp when done." "Works great. I filtered 10 gallons very quickly. It came out crystal clear." If those recommendations are solid enough, then check out the price on Amazon. If you are looking for a cheaper filter, the Bouncer comes in at a budget of under half of Midwest's offering, making it a cheap solution for those who want a clear beer but need to save some pennies so they can grab some nice hops. "I'm pretty impressed with this solid little rig. It clears out all the large stuff without issue on 5 gallon batches. I use false bottoms and nylon brew bags for hops and speciality grains, so I typically have very little junk in my wort. This did catch all the stuff I missed, however, and kept it out of the primary fermenter." "I was skeptical about how this would make a difference, but I have never had better clarity with homebrew than after applying this filter; even without the use of Irish moss or whirlfloc tablets, the two batches that ran through this came out beautifully. Easily installed and will use it with all of my future batches." "I got to use this when I transferred an IPA from Primary to keg. I dry hopped in the primary so there was a lot of hop detritus in there. Bounced filter it all out. Great product." Sounds like the smart choice then. out of your serving tap. To use your bouncer out of your brew kettle, simply connect it to your brew kettle valve with standard tubing, or cut your siphon tube line near the top, and insert the barbs into the tube. Pay attention to the arrow that indicates the flow direction. Make sure you have disassembled the bouncer and dipped it in sanitizer just before you use it. Then open your valve, or pump your siphon. If the flow decreases too much, you can stop the flow, remove the bowl and filter, rinse, sanitize, reinstall, and keep going. The other methods are discussed here. So if you take these brewers at their word, this inline filter has it going on. How does a beer filter work? Filtering has been around for donkey's years. Pool filters, dust filters - they are simply screens which let the desired substance through, preventing the unwanted from having access. It's the same with a beer filter. The screen filters the unwanted beer particles like proteins and other hazy bits. In the case of beer filters, the measurement term for the size of the holes in the filter is a micron. Most filters have a micron of one. Anything sized about 5 microns will tend to let the yeast through, which is not the point of this exercise! Can I reuse a beer filter? There are indeed filters that you can reuse. They require some earnest maintenance. Backflushing to clean them is really important. You need to clean away all the beer residue as that can be a vector for the contamination of your beer. This means you'll need to have sanitized them before using. Many brewers soak the filter in a Starsan solution. That said, there are some strong arguments not to reuse them. The biggest one is to simply avoid the risk of contamination. If a filter is 5 bucks, why worry about reusing them? We totally get of course that 5 bucks is five bucks and a penny saved is a penny earned so if you can clean and sanitize your filter properly, go for it. What is the difference between a pleated and spun filter? A pleated filter is designed in the form of pleats. This means the filter has mean folds - the idea being you create a larger surface area meaning you can filter faster. A spun filter is usually made of polypropylene fibres and are 'spun' together to look like foam packaging. Each filter should load the same way into the filter's housing. What is a plate filter? Plate filters are a different kind of device but work on the same principles. They are very common in breweries and wineries use a large plate filter system to achieve clear beer product however, smaller versions can also be used by backyard brewers. You need a kegging system to use the plate filter to transfer the beer under a low PSI pressure. If you use one, a good trick is to run a gallon of water through the filter set up to help remove any 'papery taste flavor" that might transfer through into the beer. Where can I get replacement cartridge filters? The beauty of the using a filter is that there's a thriving competitive market so there are plenty of online sellers and beer merchants that sell replacement cartridge filters. The benefit of a plate filler is they generally offer a greater filtration surface area over traditional cartridge models. Many are also interchangeable between brands - so you don't need to stick with brand loyalty if you need to go for a cheaper option, the increase in quality option and you can also purchase in bulk. There's plenty of cartridge options on Amazon. Filtration is not the answer to preventing bacterial contamination in beer. I have no idea why people think this is the case. Filtration will not remove extraordinary amounts of brewer’s yeast from the wort (if you have over pitched). You may need to run it through twice or use a double kit system. Get a kit which allows you to swap out different brands of filters as you may find you want to use difference micro sizes or use a pleat or spun filters. Using a filter is not the only way to clear beer, remember you can use finings, cold crash and simply bottle age and let the sediment settle. If you're a winemaker, you can totally use a filtration system to clear wine. It is best done just before bottling. If you think you are being clever by coming up with the idea of using coffee filters that have been wrapped around the end of a siphon tube, you're probably dreaming on that one. The coffee filter will quite likely filter WAY too slowly and probably cause blockage quite easily.